My review at Good Reads with Ronna, where you can find the latest and greatest in children’s literature. Salina Yoon has created a wonderful story with Found (Walker Books for Young Readers /Bloomsbury 2014; $14.99, Ages 2-6.) Bear finds a toy bunny in the forest and wants to find its owner, so he posts “found” flyers in the forest. Time passes and no one claims the bunny, and Bear becomes attached to it. It is, after all, “the most special thing he had ever seen.” But eventually Moose, the owner, spots Floppy, and Bear must prepare to part with his new, treasured toy. I won’t give away the ending, but I will say that it has just the right touch. Colorful socks are for more than just keeping tootsies warm. 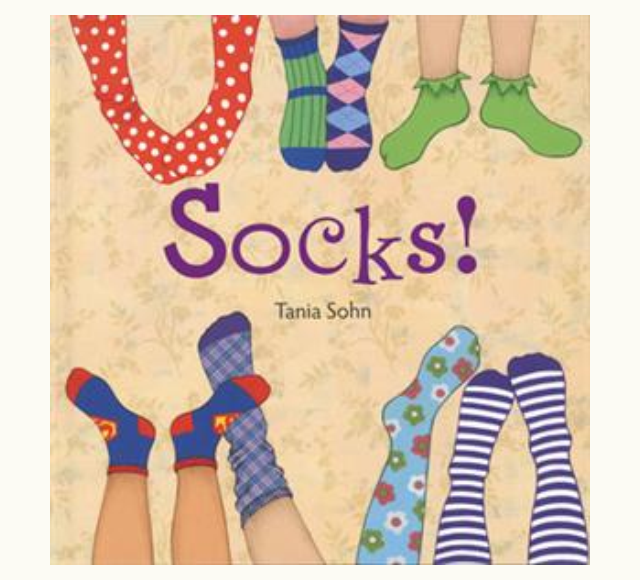 A young girl and her adorable kitty explore what they can do with an armful of socks in Tania Sohn’s picture book, Socks! The striped socks inspire the girl to dress up like a witch and the green socks are an opportunity to hop like a frog. Knee socks are the perfect length to imitate an elephant’s trunk. What’s in the package? Special socks called beoseon that Grandma sent from Korea. Simple in its language and concept, Socks! is a guide to seeing these everyday accessories as more than mere footwear. With a little imagination, a child can transform these foot warmers into puppets or even use them as an opportunity to become a super hero. Socks are fun. Socks are colorful. We love socks! 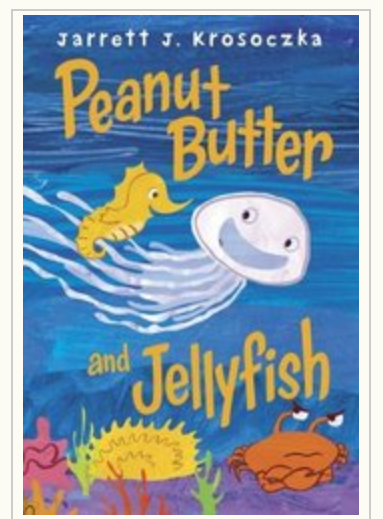 My review of Peanut Butter and Jellyfish by Jarrett Krosoczka from Good Reads with Ronna, where you can find the latest greatest in children’s books. Summertime means the beach. It also means opportunities to meet new people at camps, so a story about seahorse Peanut Butter and his best friend, Jellyfish, is a perfect avenue to the themes of friendship, bullying, and coping. The pair loves to explore their ocean home. They have so much to see, such as a sunken ship and reefs. Unfortunately, their explorations take them near Crabby who taunts them every time they swim by.